In 1989, warlord Charles Taylor helped plunge Liberia into a brutal, bloody and prolonged civil war. On Nov. 18, ProPublica and Frontline investigate the untold story of the relationship between Taylor and an iconic American business: Firestone. Firestone's rubber plantation — the world's largest — left an indelible footprint on Liberia's economy and culture. Our investigation found that Firestone became the source of critical resources for Taylor's ragtag army. The company paid millions of dollars in taxes to Taylor's rebel government and hired Taylor's soldiers to protect its rubber plantation in Liberia, even as its own employees became caught in the conflict. Few people know more about Firestone's impact on Liberia than the tens of thousands who have worked on the plantation. Were you a Firestone employee? Do you know someone who was? We're interested in hearing from Liberians, Firestone workers, or others who have memories from this time. 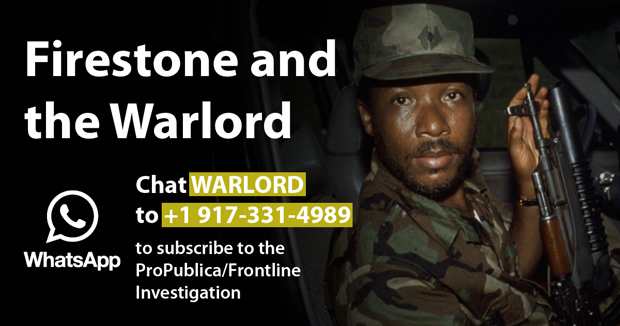 ProPublica invites you to follow this investigation by adding us as a WhatsApp contact. Before you start, if you don't have WhatsApp, you can download it here. Once you download WhatsApp, or open up WhatsApp, the number will already appear as a contact. You'll get a confirmation message once you've signed up and we'll add you to our reading list. This story unfolds in seven chapters, and we'll be filing excerpts on WhatsApp with every chapter. Miller will be inviting you to answer questions around key developments in each chapter — much like a book club. We'll message you a summary and link to each story chapter. As you receive chats from us, we invite you to respond back with your comments and questions. If you have any questions about WhatsApp and getting started, please contact [email protected].